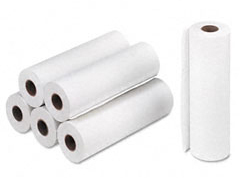 Alliance brand Thermal Fax Paper is made of the highest quality thermal paper. Despite an overall reduction of use, fax machines are still used to send important documents quickly when an email doesn’t cut it. Today, business owners conclude that owning a reliable fax machine is still a very essential and inexpensive business tool. In addition, Alliance brand Thermal Fax Paper includes three layers - a paper substrate layer, the base layer that includes a binding element with a porosity improver that assists the thermal transfer, and the active layer that contains a colorless chemical formula to heat. Our Thermal Fax Paper is resistant to fading over time and produces clear and vivid printouts. The paper is used on almost any compatible thermal fax machine, and with automatic paper cutters separating pages. Quality and satisfaction are guaranteed. Core Sizes: 7/16", 1/2", 1", 1.5", 2"